In case you were wondering, the gold that is used in Hawaii Jewel jewelry is not a vermeil or plating. 1/20th of its weight is actually 14 Karat Gold. 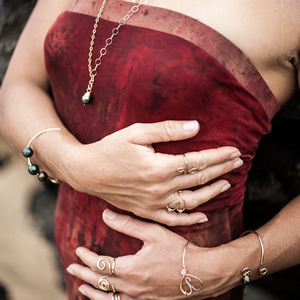 This means that Hawaii Jewel Gold jewelry will not change color, wear off or tarnish! Gold is an amazing metal and costs me twice as much than silver. So, remember, when ordering Hawaii Jewel gold products, THE PRICES ARE A DEAL! 14/20 (or 1/20th 14Karat) gold-filled, is made by heat and pressure bonding gold to a brass core. The 1/20 notation refers to the ratio of the 14 Karat gold layer to the brass layer by weight, which is 5%. The exterior of the jewelry will be solid gold. It is a superior product to gold plate as it contains much more gold and will not tarnish like gold-plated jewelry. 14 KGF is low maintenance, easy to care for and simple to keep clean. View Hawaii Jewel Gold Jewelry here. For the silver jewelry, I have upgraded from sterling silver to Argentium Silver. While it costs me a bit more for Argentium Silver over Sterling Silver, the quality is certainly worth it. Argentium has more silver in it than sterling silver does! At Hawaii Jewel you get Argentium Silver for the price of Sterling Silver. Purer… Argentium sets new purity standards for silver. Argentium is always purer than traditional sterling silver. Sterling Silver has a small percentage of copper in it, which is what causes it to change color (oxidize/react to air). Argentium Silver does not have any copper in it. Argentium Silver is much less likely to react to air and tarnish like Sterling Silver. Hawaii jewel uses 100% Argentium Silver for all hand hammered and hand crafted pieces, and Sterling Silver for all chains. View Hawaii Jewel Silver Jewelry here. Brighter… Argentium is brighter than platinum, white gold and traditional sterling silver. It is the whitest of them all. Responsible and Ethical… Argentium helps the preservation of our natural environment and to conserve natural resources. It is certified that Argentium is produced using only RECYCLED SILVER! To learn more, visit Argentium Silver. The definition of Sterling Silver is based on the British Sterling Standard. To qualify as Sterling, metal must contain a minimum of 92.5% pure silver. The remaining 7.5% is usually Copper. Copper adds strength to the metal. Our sterling maintains the highest standards. At Hawaii Jewel, all chains are Sterling Silver. View Hawaii Jewel Silver Jewelry here. All crystals used at Hawaii Jewel are genuine Swarovski Crystals from Austria. View Hawaii Jewel Swarovski Crystal Jewelry here. Amazing Black Pearls from Tahiti! Black Pearls are really born in all these gorgeous colors! Directly from the tiny atoll, Apataki, in the Tuamoto island chain of Tahiti, come these gorgeous, lustrous pearls, to you! 4 different shapes: round, oval, circle, and baroque. Sizes 8-13 mm used. Each beautiful pearl was inside of an oyster for 2 years! 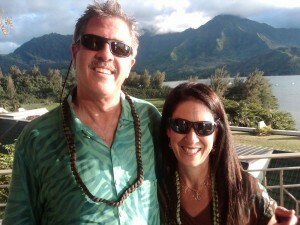 Check out Hawaii Jewel Black Pearl Jewelry here. — Jackie, Long Beach CA. I am passionate about comfortable and properly fitted jewelry. I love wearing bracelets that don’t hang down my hand, rings that don’t get in the way, and earrings that are so light, I forget that I have them on. I keep these principles in mind when creating each piece of jewelry. If you are particular as well, need a variation, or would like to discuss any piece in more detail, PLEASE CONTACT ME BEFORE ORDERING, so together we can make a CUSTOM FIT!